Meet scientists from the Allen Institute for Cell Science at this year's ASCB conference. Visit us at booth #723, attend our Tech Talks, preview our presentations, keep up with us on social media (#ascbembo18), and stop by one of our posters. The Allen Institute for Cell Science will host booth 723 in the exhibitor hall where attendees can speak with our scientists and learn about our current and future work. 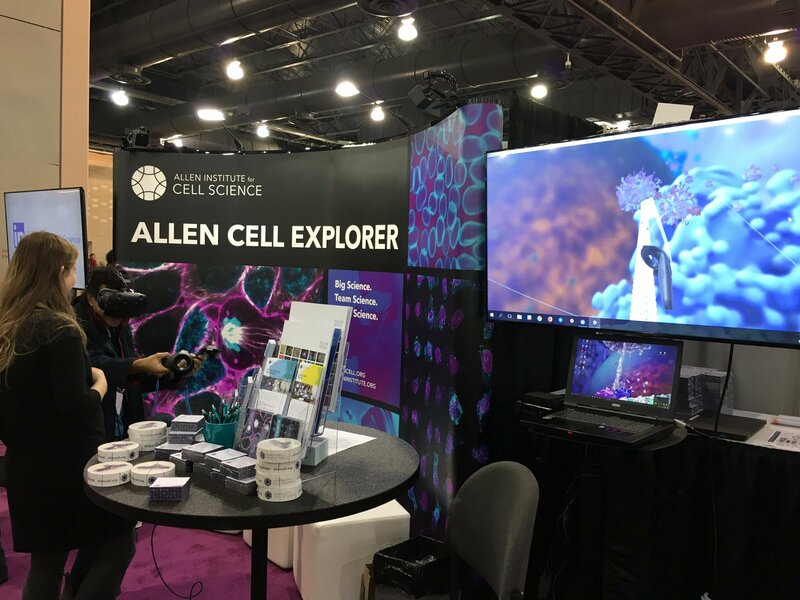 Be sure and check out the demonstration of our resources in virtual reality, hear about our newest work in label-free imaging, and ask about our 30 available cell lines. Presentation: Creating a stem cell state landscape: integrated cellular reorganization during differentiation and division of the human iPS cell. Presentation: Machine learning for cell organization: new methods to capture variation and integrate observations. Presentation M1: Creating a stem cell state map of hiPSCs from pluripotency through cardiomyocyte differentiation. Presentation: Human iPSCs: from image to information. See posters presented by Allen Institute for Cell Science staff members at ASCB.